I am not sure whether concrete is the right material for me to use for my home. Can you share with me the advantages and disadvantages of concrete? Wow Lily, The average person thinks of concrete sidewalks and not concrete design! I am a big fan of concrete! It can be transformed into highly versatile and unique objects such as bathroom sinks and countertops, kitchen countertops and backsplashes, fireplace surrounds, wall panels, and furniture. I would definately consider concrete if you think granite or marble is too common or if you think solid surface material looks plastic. If you appreciate hand-crafted items and you want a one-of-a-kind custom piece, then concrete is the right material for you! 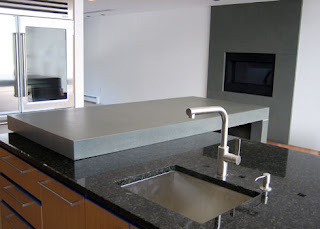 A good source for concrete kitchen and bath countertops is trueformconcrete as shown in the kitchen pic below. 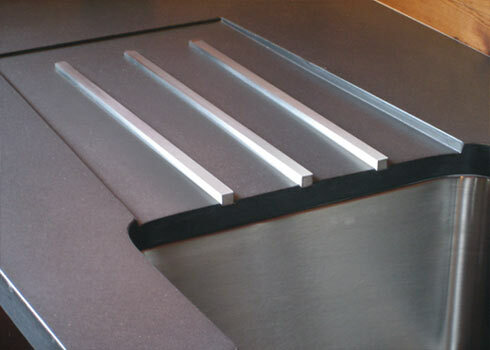 To showcase personalization, you can integrate anything into concrete(glass,stone,metal) like the metal strips shown in the kitchen countertop below. Let me be clear though, concrete does have imperfections! But, I see those imperfections as an advantage and not a disadvantage. Yes, concrete has variations in color and texture and are susceptible to hairline cracks; however, these tiny cracks are not structural and are a result of natural shrinkage, stress and movement in the concrete. Lets discuss everyday usage: it is easy to maintain concrete if a good penetrating sealer has been applied. Spot repairs can be made if necessary. Concrete is also easy to clean with mild cleaners or soaps. Just like any stone, you should not put anything hot directly on it. Highly acidic products and chemicals should also be avoided and cleaned up right away to prevent damage. As for the disadvantages, concrete's corners can chip and its surface can scratch. So don't hit the corners with anything hard and don't cut any food on it without a cutting board over it! There is so much good concrete design out there: Take a look at these unique 'green' integral sinks from fiddleheadconcrete. I say 'green' because fiddlehead concrete is an 80% blend of recycled glass, recycled concrete, fly ash and carpet tiles (to help resist cracking). 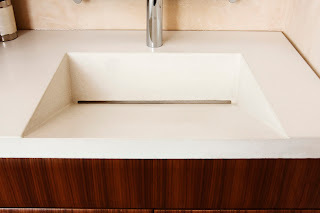 I love their shapes (see above pic) ...their sinks have clean modern shapes and are like water sculptures. Water cascades down a geometric basin and ends into a narrow slot where the water disappears! So cool, I want one of those for my next renovation! 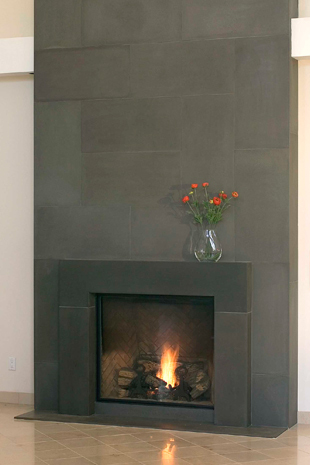 Lastly, cast stone fireplace mantels and surrounds by solusdecor are absolutely stunning! Their cast concrete transforms an ordinary fireplace into a sensational focal point for any room! See the above pic to the right. Clean modern lines with an earthy feel! Solus also makes smooth and luminous concrete floor tiles that are cast and finished by hand. (See pic above to the left) They offer 12 colors in various sizes. What a statement, if you vary the colors and sizes! I can even see using them as a backdrop on a large wall. Know these interior tiles are durable but susceptible to surface scratching and scuffing. They do tend to self-buff and get more polsihed with wear. Its amazing what a natural material can do! Lily, I just scratched the surface (ha ha) but I hope this has been helpful information for you to decide how to use concrete in your home! I LOVE concrete!! Great info!! Love the sink in the first pic! I am going to renovate my outdoor space. Do you have any firepit suggestions?